The holiday season is upon us. While you’re busy packing your bags, preparing to-do lists and picking out the best holiday outfits to wear you were obviously also worrying about taking along cash and international debit/credit cards. But what if you didn’t want to worry about taking adequate cash & can actually travel cashless? Thomas Cook’s One Currency Prepaid Travel Card is exactly what you need. This card will help you hit the ground running and help you spend more time enjoying your vacation and literally no time worrying about money. The first of its kind, this card will help you travel cashless anywhere you want. Just in case that notion of saving precious wallet space isn’t enough, we’ve put together a list of the top 3 benefits of the first ‘One Currency Pre-Paid Travel Card’ in the world. Your travel funds are locked into the foreign exchange rate of the country you plan to visit on the day you pick up the card. So if the exchange rates fluctuate while you′re on holidays, you won′t suffer a loss of funds. That′s something that would′ve been very useful to lock in about a year ago! Cash is the least-secure way to carry your holiday spending money. A five-second encounter with a pickpocket can leave you broke – and definitely not in a holiday mood! There will always be some instances where cash is the only payment method accepted, but for most transactions a travel money card does the job. Lock and unlock your card for added security. Now go ahead and enjoy the delightful spots, dine out, and take in the breath-taking landscape and exotic culture of the country without having to worry about money. 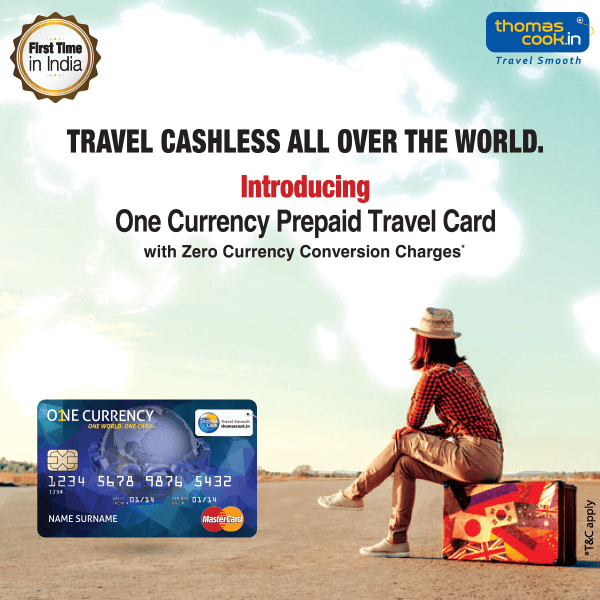 Thomas Cook’s One Currency Prepaid Travel Card is exactly what you need, If you want to travel cashless all over the world.